Sylvia: Looks fantastic! Thanks for sharing all of your tips. I am going to try this as I just got some sprouted wheat flour. 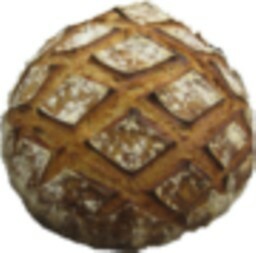 Your welcome and enjoy this is a very delicious bread! beautimous would be these breads. Crust that only a wfo can make and a 90% hydration, whole grain sprouted crumb that is just lovely too. I'm guessing jelly machine pomegranate jelly to top it off! Lucy bettter get me one of those for x-mas. You are right the jelly with the bread would make a fantastic Holifday gift set. Poor Mike, I feel his pain. I forgot the staybil and my old gas clogged the 6 carburators on my bike - again. Last time this happened they charged me $600 to fix it! This time I'm going to try and unclog them with some carb cleaner in the gas first and ride it for 100 miles to hopefully clean them out! Happy baking Sylvia ....Oh yeah...I got some sprouted grain thsi week too - look see! We are really enjoying these breads and the neighbor too! Since my daughter is not eating bread, processed, sugar, meat and I forget what else she will be loving pizza and a loaf of one of my WWSF loaf and pizza. Mike will get to rest this Sunday and maybe even enjoy some pork roast out of the wfo. I sure hope you get the bike in shape and enjoy your ride. Things will be in good paws with Lucy attending to the sprout garden. Great post Sylvia and terrific bread. I am on the way back from KAF and my trunk is overflowing with flour. Can't wait to give your formula a go but alas I don't have a WFO :(. This bread is as easy to make as it is enjoyable to eat. You'll get the true flavor and feel for the dough with this 100% SWWF. I highly recommend the book too. You don't have to have a wfo to enjoy all the lovely bread formula's and abundance of information written. It's great, anything you can cook in a home oven you can make in a wfo and the other way around. It was like bakers heaven! I had gone 1 time before 3 years ago and have been dying to go back. I went last time before they redid the entire store section so now it is at least 3 times the size and beautifully done. I just barely fit the 9 bags of goodies in my trunk! I will certainly look to add that book to my library. Now that you mention it. I do recall seeing a picture of their new store in their e-mails. Looks like quite a nice store to keep up with their growing popularity. You won't be disappointed in this book. I got mine early because I had it pre-ordered. It also was recommended to me by breadsong. Amazon had it priced higher at first but did give me the new lower price at it's release. That is a beautiful basket of bread, Sylvia! The sprouted wheat flour sounds great, I'll have to keep an eye out for it. Thanks for sharing! For your lovely compliment and your welcome! I have ordered SWWF online and my local Whole Foods and specialty market carries it. I'm still looking for a bread using SWWF that knocks my socks off. I am tempted to give this one a try. Mike and I thought this bread extraordinarily delicious! Toasted with my homemade mixed berry jam is remarkably yummy! I'm Sorry for your husband's misadventure, Sylvia. I'm sure this wonderful sprouted loaf of yours warmed up your hearts. This flour sounds so delicious, i'm tempted to try it. No sprouted flour here though. We are just about to leave to take the new parts to the shop and hopefully all will be fixed. I hope someday you will be able to try this bread. You won't be disappointed. Sorry to hear about Mike's motorbike and hope it all worked out with the parts. You make gorgeous Italian breads and the country semolina is so pretty - as is the pomegranate jelly, such color! I am glad you are enjoying Richard's book. I've made Richard's Sprouted Whole Wheat - it is a really lovely bread, and yours looks beautiful! ; love the X's for the scoring. I'm so looking forward to your posts - your talent, your WFO, and Richard's book in your hands - can't wait to see what's going to happen! The country semolina loaves are one of our favorite house breads. It seems I'm always messing a little with my previous formula. It was fun trying the stronger italian caputo flour in this one...it had a little more chew to it and didn't need any add ins for good carmelization. Next I'll make it with the chefs caputo and then probably back to just my regular bread flour. I like saving my dearly priced caputo for pizza's and it does make the pizza crust we enjoy the most. I'm so pleased to add Richard's new book to my collection. Just wish I could have had it back when I first started using and learning about my wfo. I've pretty much figured it out now. Each oven will have it's own ways. I just jumped in and let it speak to me 'lol' didn't even know how to light a proper fire when I first starting using it I 'smoked up the whole neighborhood'. That's a very funny story. Wfo books would have come in very handy. I've learned so much just from cooking in it. They really aren't that hard to figure out once you get started, and seeing some basic charts on my oven from Forno Bravo helped me a lot. I have enjoyed Richard's book very much. It's filled with a lot of important information and seeing that I have been doing things right and learning some new tricks like clarifying butter in the oven! Seeing that we both use some of the same utensils, the same way was a good feeling. I had to laugh when I saw the same tupperware..one of my all time favorites I use often, mine is over 40 yrs. old and he also likes using the small plastic containers for pizza dough. Mike and I enjoy his SFWW bread very much, it's a keeper. Something I haven't tried and don't think I will is cooking a steak directly on the hearth. Even with such easy cleanup, I can see how that would work. I have tried them directly on the hot coals and that does work with both meat and veggies, in a pan, I don't care to cook my steak..to much splatter. My favorite is just on the tuscan grill with some coals underneath. I always try to use all my heat in my oven as Richard explains in his book. It's not always easy multitasking the oven as I call it. Mainly because I buy my wood and prefer the oak and it's pretty expensive because I don't store a lot. My oven is first a pizza oven so making bread I have to steam a lot because of the higher domed roof. I don't think things will change much from the way I have been using my oven. Sorry for the late reply. Your country semolina bread is *beautiful* and I'm glad you're getting so much out of Richard's book. It's very obvious to me you've got your oven figured out!!! for letting me know that you baked and enjoyed this bread!